A large tree with non-descript grey bark. The shape of the leaf blades varies from lobed, particularly on young trees to entire or unlobed on mature trees. Lobed leaf blades are up to 48 cm long, unlobed (entire) leaf blades to about 10-25 cm long x 2-6 cm wide. 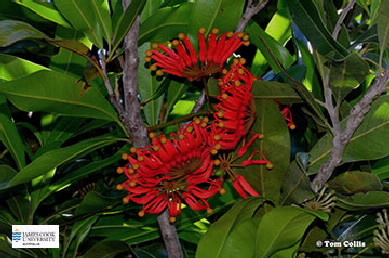 Inflorescence produced on the twigs back from the leaves. The bright red flowers are arranged in umbels, with 12-15 flowers in each umbel, appearing like spokes in a wheel, hence the common name. Fruits are a dry follicle, opening along one side to release flat, winged seeds. Each fruit is about 4-6 cm long, and contains up to four seeds.